New guidance for the physical training test makes clear when your commander can kick you out for failing your PT test. The guidance also covers what happens if you are sick or injured during the test, if you can’t complete the test, if you’re deployed and other issues. Read all about it in this week’s Air Force Times, on stands now. 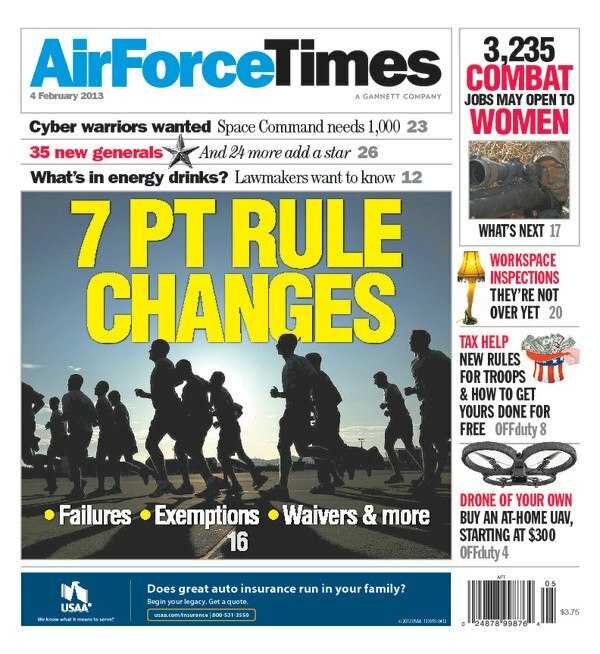 Also in this week’s edition, the Air Force is considering opening 3,235 combat jobs for women as part of a wider Defense Department effort to end the combat exclusion for women. Those jobs include special operations positions, such as tactical air control party airmen, prompting U.S. Special Operations Command to review whether women can meet the physical and mental standards for those jobs. In other news, the Air Force plans to continue health and welfare inspections to keep material that objectifies women from returning to the workplace. Instead of surprise inspections, they will likely become routine. Meanwhile, Chief of Staff Gen. Mark Welsh told lawmakers recently that any military training instructor who has a relationship with a recruit – consensual or otherwise – doesn’t belong in the Air Force.